What better way to follow a wonderful Vietnamese Grilled Pork than to serve some Thai Chicken Satay. 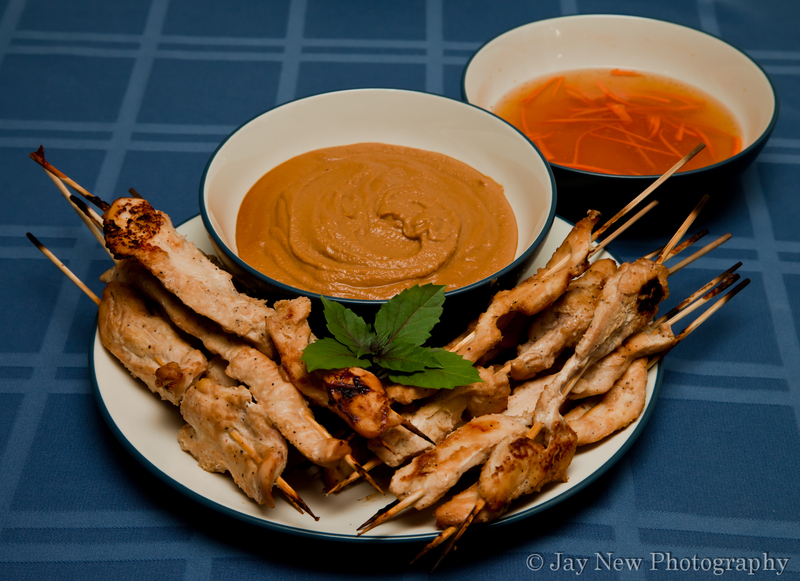 Chicken Satay is a very simple grilled chicken, served on skewers and a peanut dipping sauce. During the summer, here in NYC, there are often street fairs and many of the street vendors would serve these delicious treats. I loved walking around those street fairs, taking in the sights and smells of all the foods and artwork, while munching on tender chicken. These homemade versions are just as good (and less expensive). Serve with some homemade peanut sauce and you have a perfect appetizer, side dish or light main meal. I hope you enjoy them! Broil chicken for about 5 minutes on each side (your skewers may burn a little, so keep an eye on them, to make sure they do not catch on fire). Depending on how thick your chicken strip are and how packed you skewered them, you may need to increase or decrease your cooking times. Allow chicken to rest for 5 minutes, covered, before serving. I LOVE, LOVE, LOVE peanut sauce. Don’t ask me why, but I love them with Thai spring rolls. So thinking about making this wonderful chicken satay recipe you provided with the sauce is making me excited lol. I am so carving Thai Spring Rolls right now 🙂 Let me know how you like the sauce!! I am totally making this (w thigh meat.) I used to have a great recipe for it, but lost it along the way, and this looks like an excellent stand it! Thigh meat makes for a more moist satay 🙂 that is for certain. Chicken breast tends to get very dry. I hope that this recipe is what you are looking for 🙂 Happy cooking! I love love love chicken satay and peanut sauce, it has to be my favorite meal ever. I can’t wait to try your recipe!